Business is booming and product is flying off the shelves. That’s a good thing, right? But amidst all the excitement, you start to realize that the physical demands and detail work involved with picking-packing-and-shipping orders is taking its toll. Orders are going out late or, worse, wrong. Tracking is getting complicated. Costs are spiraling upwards. And customer complaint calls are escalating. It’s time to call in reinforcements. 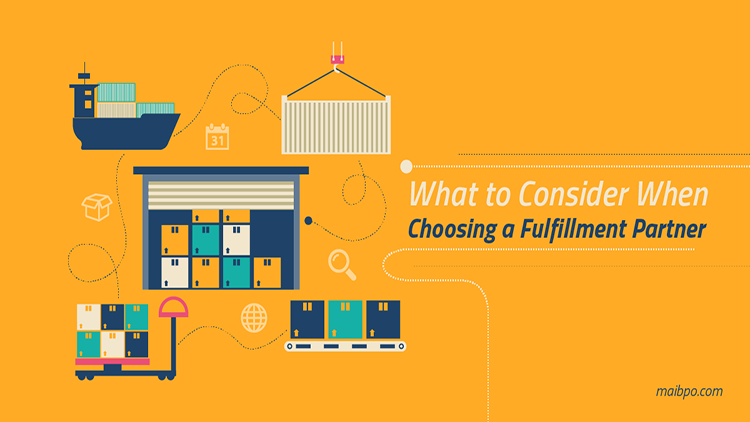 Before you choose a fulfillment partner, it is necessary for you to evaluate your specific needs. Prioritize your requirements and look for partners who can meet the expectations of dealing with the products and services offered by your business. Do thorough research on your prospective partner. As mentioned above, they should have the resources to fulfill the product requirements specific to your business. A proper background check is highly important. They will ideally be experienced in managing programs similar to yours and should be able to meet or exceed appropriate compliance and confidentiality requirements. Do some due diligence by checking existing client references and pay particular attention to comments about the fulfillment company’s track record for reliability and accountability. Look beyond experience when you are evaluating potential fulfillment partners. Explore and ask questions about the technology they use and how it will specifically benefit your company. You are about to entrust a critical business operation to the fulfillment company and should be confident they will make a positive impact on your business. As your fulfillment partner, they will be sharing their infrastructure, application and software, staff and management systems with you so be sure you have clarity about the technology they use and how well it syncs with your company. Build a customer demographic before outsourcing your fulfillment. Once you have that data, you can evaluate the geographical location of potential partners. If your customers are spread around the world; then you would require companies with adequate resources to deliver products on time. Another advantage of roping in a fulfillment partner is that they can help you reach out to new markets, thus expanding your business beyond your boundary. Pricing is one of the most important factors when you select a fulfillment partner. Transparency is extremely crucial for your business. Prior to joining hands, verify the cost involved in the set-up, shipping, fees, management, maintenance etc. There can often be hidden charges that you might overlook at the beginning. So go through every detail thoroughly before you make a decision. You should have complete knowledge of the pricing structure and details of every transaction as one of the reasons to go for outsourcing is to reduce overall expenditures. Does your fulfillment partner provide a continuity management system that would accept changes requested by customers online? Speaking of continuity management systems, the third party logistics provider would help your business generate more revenue by allowing and increasing cross-sales that involve other products. Besides having a continuity management system, your fulfillment partner should maintain a proper order management system which will prevent generation of errors. An effective and efficient order management system is the key to sustain successful communication with the customers resulting in higher satisfaction. A good logistics provider will have an organized inventory management system with strategic checkpoints to ensure accuracy in the inventory at all times. If you have any special requirements that need to be imposed on your inventory seasonally or at all times, your fulfillment partner should have the resources to provide the same. Choosing the right fulfillment partner involves doing upfront research which will subsequently lead to a successful business relationship and help in the expansion of your company. Having the right third party logistics provider by your side will enable you to manage your time, provide a high degree of order accuracy, improve the customer experience, reduce costs, broaden your market reach and grow your business.